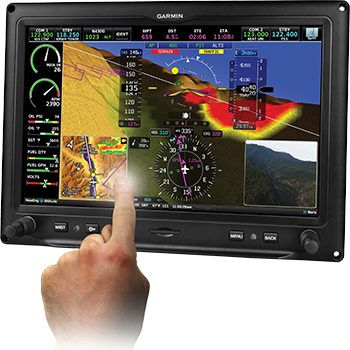 Built from the ground up with a native touchscreen interface – but retaining all of the tried and true capabilities of the G3X – the new G3X Touch™ is the smartest, most advanced large-format flight display we’ve ever designed (and priced) specifically for experimental/amateur-built aircraft. Well-equipped 7-inch systems start at only $4,599 while EIS-equipped systems start at only $5,199. The even larger 10.6-inch display systems with EIS start at $6,099. The G3X Touch suite of displays offer incredible installation flexibility; use any combination, up to 3 of the large 10.6-inch and 7-inch high-resolution displays which are configurable for split-screen mode. Add the optional GTR 20 remote comm to tune frequencies with only a few touches and gain powerful features like 3D Audio that are typically only found in audio panels. Consider the GTX 23 ES remote transponder to free up even more valuable panel space for your displays, as well. Terrain/obstacles alerting, worldwide geo-referenced FliteCharts® and SafeTaxi® airport diagrams SiriusXM® weather, ADS-B “In” traffic and weather and angle of attack sensor can all be added easily. 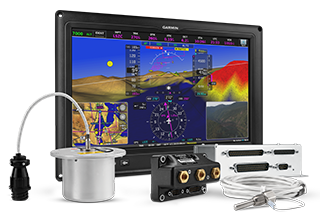 Built-in Connext-enabling hardware, such as ANT+™ and Bluetooth®, provide wireless integration with your iPad® or other compatible tablet device running Garmin Pilot™, flight plan transfer capability and remote control of accessories like the VIRB™ action camera right from the display. Adding the GDL 39R ADS-B “In” datalink further providers your G3X Touch displays and tablet both weather and traffic while in the U.S. Plus, the affordable Garmin autopilot system integrates with the G3X Touch, complete with advanced features approaches and auto-trim, as well as flight director, indicated air speed hold and straight and level button when installed with an optional control panel. 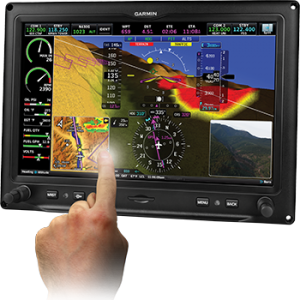 With up to 3 high-resolution 10.6-inch or 7-inch displays – each that and work in PFD, MFD or in split PFD/MFD mode – the G3X Touch makes it easy to create a system that will fit your needs, panel space and budget. For example, use 2 large 10.6-inch displays while adding a 7-inch display for dedicated EIS engine monitoring or a dedicated video display – it’s your choice with a lot of possibilities. With 2 displays, you can configure your panel to provide more information in the least amount of space. Seamlessly integrate a 10.6-inch and 7-inch display, or chose 2 of the same size. Configure 1 display as a split PFD and MFD, and the other as a dedicated display for a variety of features, including traffic, geo-referenced charts or engine information. This configuration also offers full backup capability in case one display fails. Hardware Installs simply. Adds immense capability. Each easy-to-read display features a high-resolution WXGA screen with infrared touchscreen technology with a large touchpoint that that ensures precise inputs and minimizes inadvertent touches – even with gloves. LED indicators make it easy to tell when sensors have been correctly connected and flexible mounting options allow the GSU 25 ADAHRS to be mounted either on back of the display or remotely. Wireless Connectivity Complete control. At your fingertips. The G3X Touch comes equipped to take advantage of Connext™, our network link and in-cockpit wireless connectivity system that makes your compatible mobile device with Garmin Pilot™ or aera 795/796¹ a true cockpit companion. Use it to a create flight plan in the comfort of your home, office or pilot lounge, and then transfer it to your G3X Touch with a tap or two—waypoints, airways, arrivals and all. That leaves you more time to focus on pre-flight activities once you arrive at the airport. Adding last-minute or en-route flight plan amendments from ATC is just as easy. Simply make them on the tablet, and sync again. There’s no duplication of effort, which brings greater efficiency and work-saving convenience to managing your cockpit. All it takes is the addition of an affordable GSA 28 “smart” servo units to give your G3X a range of autopilot capabilities similar to those provided by our top-end flight control technology. You have the option of purchasing 1 servo (roll only), or 2 servos (pitch + roll) to add the level of capability you want. Even better, the Garmin servo provides a built-in interface to drive a customer supplied trim servo at no extra cost. When the autopilot is off, the servo provides speed scheduling for the manual trim commands. When the autopilot is on, the servo adjusts to constantly keep the aircraft trimmed. It also features a gear train with engagement clutch and the ability to back drive the brushless DC motor, providing multiple levels of safety without the use of a shear pin. Plus, servo software updates are done over the CAN bus using the G3X SD card, eliminating the need to send the servo back to the manufacturer for updates. The optional GMC 305 or GMC 307 is a dedicated interface unit that provides advanced autopilot modes like indicated airspeed hold, independent flight director, and third axis yaw damper (when installed with appropriate servos). A control wheel integrated into the GMC 305 makes for easier pitch, vertical speed and airspeed adjustments. Plus, for added safety, the panel’s advanced LVL mode button commands the autopilot to help restore your aircraft to straight-and-level flight. And because the servos interface directly with the ADAHRS, the GMC 305 allows for standalone operation of the autopilot in the unlikely event of a display loss. Installation of the system is simple and straightforward, with industry-standard servo mounting kits available — as well as airframe-specific versions for the popular Van’s RV series (RV-4/6/7/8/9/10 models). With installation of the G3X autopilot servos, you’ll also obtain Garmin Electronic Stability and Protection (ESP-X) to provide assistance in maintaining the aircraft in stable flight. When you exceed user-selected pitch, roll or airspeed limitations while hand-flying the aircraft, ESP-X provides gentle nudges on the flight controls to lessen the aircraft’s pitch attitude or bank angle—and that correcting force grows stronger as those exceedances increase. In addition, you’ll see visual cues on the displays of G3X and G3X Touch indicating that ESP-X is engaged: Yellow chevrons provide visual pitch guidance, and configurable roll-limit indicators indicate where ESP-X engages to provide bank guidance. As you take corrective action, ESP-X fades, and it turns off when you return to a normal flight envelope. Conversely, if the system activates for more than fifteen seconds—for example, if you become incapacitated—the autopilot engages with the flight director in Level Mode, bringing the aircraft to level flight until you command otherwise. While ESP-X will not recover an aircraft in all in-flight situations, the system does provide your experimental and light sport aircraft an extra safeguard. But ESP-X goes beyond providing pitch and bank envelope protection to also offer high- and low-airspeed protection. In a high-airspeed situation, ESP-X engages the G3X autopilot servos to increase your pitch attitude, while built-in parameters further prevent the aircraft from exceeding G-limit load factors. In low airspeed situations, ESP-X engages to provide a gentle pitch-down force to reduce the likelihood of a stall—and ESP-X automatically disables when the aircraft is operating within 200 feet of the ground. In addition, pitch, roll and airspeed envelope protection parameters are all customizable, and for flight training or aerobatics, you can easily inhibit Garmin ESP-X within the automatic flight control system menu of G3X and G3X Touch, or with an optional switch in the panel.